The site of the future Seng-Liang Wang Hall for Electrical and Computer Engineering has moved. Previously slated as part of Discovery Park on the west side of campus, the College of Engineering requested the move to bring the new building closer to other ECE facilities. Future Wang Hall location (indicated in red). Wang Hall’s new location next to the Northwestern Avenue parking garage will facilitate the inclusion of a new Power and Energy Devices and System Research Complex composed of nine laboratories. This will position Purdue to contribute more effectively to the global energy challenge. 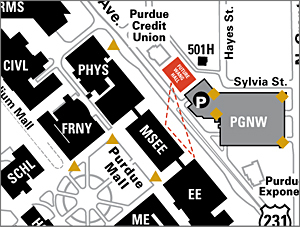 The new site is across Northwestern Avenue from the MSEE and EE Buildings, where the majority of ECE faculty, staff and students are located. The new site will complete a proposed “ECE Triangle,” which will bring constituents of the school together, creating a productive community atmosphere inspiring research and learning. The 39,370-square-foot, $18 million facility, when completed, will be named after the father of Purdue alumnus Patrick Wang, chairman and chief executive officer of Johnson Electric in Hong Kong. Patrick Wang and his wife, Lucy, gave $5 million for the new building. The School of Electrical and Computer Engineering will expand into the new facility and will continue to occupy most of the current Electrical Engineering Building and the Materials and Electrical Engineering Building. A gift of $1.5 million from Robert and Janet Fenwick of Los Altos Hills, Calif., will create the Robert and Janet Fenwick Very-Large-Scale Integration and Circuit Design Complex in the new hall. The project also received support from the Jai N. Gupta Family Foundation, which gave $850,000 to support a computational lab in the building. Robert Fenwick earned a BSEE in 1958. Jai Gupta received a doctorate in electrical and computer engineering in 1974. According to ECE administrators, the site move will have no effect on overall cost or square footage. In addition, four VLSI and Circuit Design laboratories are retained at the originally planned 4,000 assignable square feet and conference rooms and conference service are retained at same 1,350 assignable square feet. The change in location will facilitate the inclusion of a new Power and Energy Devices and System Research Complex composed of nine laboratories. This facility will position Purdue to contribute more effectively to the global energy challenge. A new MEMS Device Stability and Characterization Laboratory at 1,000 assignable square feet has been added. Additional changes to the original building plan include reduction of some lab space and office space, while other lab spaces will be expanded to fit the new location. Lab spaces dedicated to fields that would benefit from close proximity to Discovery Park will be relocated to buildings in that vicinity. Commercial leased space within Wang Hall will include a retail establishment such as a coffee or sandwich shop on the ground floor. This space will provide additional gathering space and amenities for faculty, students and staff. The timeline for design and construction of the building has been extended. Watch for updates here and on the ECE website. To contribute to Wang Hall or other ECE strategic initiatives, contact Margarita Contreni, senior director of development, at 765-496-6453 or mcontreni@purdue.edu.